Are you better off living in a new neighborhood? “We’d always known it was zoned for an industrial park, but we thought we were tucked far enough back away from the main road with enough woods back there,” Chris Beattie said. However, when Hopkinton-based technology giant EMC — its corporate campus on the other side of those woods — decided to expand its facilities in the late 1990s, the construction wiped out much of the forest, leaving only about a 20-foot buffer of trees behind the Beatties’ home. Homeowners have seen their surrounding landscape changed and churned up by Caterpillars in recent years whether for an office park or a new housing development. Between 2005 and 2013, the state lost an average of 13 acres of land to development every single day, including 50,000 acres of forest, according to the Massachusetts Audubon Society. (From 1985 to 1999, it was an incredible 40 acres a day.) 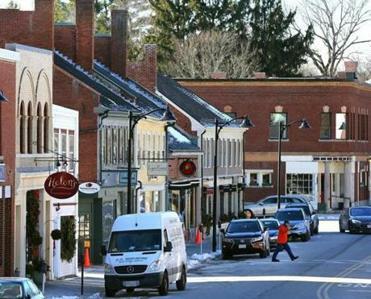 In the past decade, that growth was particularly concentrated in towns on the outskirts of Greater Boston, such as Ayer, Dracut, and Hudson. “The deck is stacked for sprawl,” said Anthony Flint, fellow and director of public affairs at the Lincoln Institute of Land Policy. Massachusetts zoning laws encourage it, Flint said, by giving wide leeway to developers. “If land is off an existing street, even a ‘paper street,’ it can go up under ANR, approval not required. That means the local planning board doesn’t have to approve it; it can just be built,” Flint said. Of course, not all development is bad. Some new commercial investment can be very beneficial to property values, he added. “ ‘Food deserts’ really need commerce. They need people to bring in grocery stores and stuff.” However, while many buyers want to be near shopping, most aren’t hoping that a hulking Walmart suddenly pops up directly across the street. In some ways, living in the urban core protects homeowners from these surprises of sprawl: When there simply isn’t any space left — when every available lot has already been built upon and spoken for — what you see as a home buyer is largely what you get. In Boston, for example, 83 percent of the city’s acreage was developed as of 2013, and another 16 percent was permanently protected — leaving just 1 percent potentially available for new development. In Medford, Malden, and Melrose, which host large portions of the Middlesex Fells Reservation , that figure is 3 percent or less. And in Somerville, a whopping 98 percent of the city is already developed, the most in the state. Even if your home is in an established residential area, that could change with little warning. “Zoning changes all the time,” McCarthy said. “At least it’s a public process, and people can weigh in and influence or change zoning decisions to some extent.” But, he added, the places most vulnerable to unwelcome changes are often the ones least able to defend themselves. “When they forced highways through cities in the mid-20th century, where did they put them? The low-income neighborhoods,” he said. In fact, a group of Boston residents is locked in a bitter eminent-domain dispute right now. Texas-based Spectra Energy Partners LP is building a high-pressure section of natural gas pipeline under the streets of West Roxbury, terminating just 100 feet from an active stone quarry. “I’m a resident of the ‘incineration zone,’ ” said Nancy Wilson, who has lived in the neighborhood for 16 years, referring to the area she said is certain to burn up in the event a quarry blast ignites a gas explosion. It’s an unpopular project among area residents and lawmakers alike and yet, it goes on. “Despite opposition from the community, elected representatives at every level of local and federal government, and legal action by the City of Boston and others currently in process in federal district court,” Wilson said, Spectra continues construction on the pipeline under eminent-domain authority granted by the Federal Energy Regulatory Commission. So, short of buying 100 acres of property in every direction to preserve your surroundings, how can a home buyer avoid an unwelcome surprise next door? For starters, look at the existing zoning. “You don’t want to be too close to things that permit land uses you don’t want, whether that’s casinos or liquor stores or whatever,” McCarthy said. Then see whether and how frequently the town tends to change its zoning rules. “Some towns don’t make zoning changes for 50 years, some make them every 10 minutes,” he said. The edge of any town is typically more vulnerable to unsavory development, McCarthy added. “When you get to the border between two towns, that’s where you’ll see the junkyard or other unwanted-but-necessary commercial establishments,” he said. “They plunk it at the border to get it as far out of the town center as possible.” What’s more, if you live on the border and the development is happening in the adjacent town, as the Beatties experienced, you’re somewhat powerless to fight it. “You have no standing in that community,” McCarthy said. McCarthy also encourages homeowners to evaluate new development with an open mind before assuming the worst. “There’s no shortage of NIMBYism,” McCarthy said, referring to the widespread not-in-my-backyard mentality. “It’s easier to stick with what you know than go into the unknown.” But as so-called smart growth becomes more common — the residential-over-retail, mixed-use development that encourages walkability and live-work neighborhoods — homeowners may not have as much to fear when new development breaks ground next door. If you’re still opposed to a new project in your neighborhood, you do have some recourse as a homeowner. You can rally neighbors to sign a petition and stir up public support. Attend town or city council meetings and voice your opposition, both in person and in writing to elected officials. And when all else fails? Some people have resorted to civil disobedience. Hundreds of nonviolent demonstrators from West Roxbury and beyond have been peacefully but persistently trying to disrupt Spectra Energy’s crews, to the tune of at least 177 arrests, as a last resort to slow or stop construction of the pipeline. Some Resist the Pipeline members locked themselves to a car to block access to the construction site in August.